Eco-Friendly Cosmetics & Customers We Love! I love all natural beauty alternatives – and honey is one of my favorite all natural go to beauty products. It is great for your skin, your hair, and is an amazing alternative to other beauty products that are full of chemicals – products that are doing you more harm than good in the end. 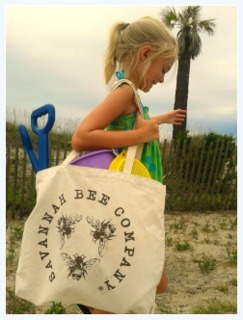 The Savannah Bee Company makes their health and beauty products with all-natural ingredients, and are also responsibly packaged, as well as tested. The company not only uses honey in their products but also beeswax, royal jelly, and propolis. We love when other companies share our passion for social and environmental responsibility! We are happy to have partnered with them on their custom print tote bags – that are both reusable and cute!